Work was extra busy this week, and by Friday night I was both thrilled that the weekend had arrived, and exhausted from a 60 hour work week. Since I had barely seen the sun all week long, I really wanted to get up before sunrise on Saturday morning and spend the whole day in the field. However, my exhaustion won out over my ambitions, and we slept in and didn't get going until after 11am. That wouldn't spoil the day most of the year, but in the winter when the sun sets by 4:30pm, a late start can cost you a significant portion of those precious few daylight hours. My "Plan A" for the weekend would have been to check for the Red-Throated Loon at Valmont Reservoir (Boulder County) just after sunrise, the Northern Cardinal at Dakota Ridge Trail (Boulder County) immediately after, then head out into the mountains to check locations with feeders for Rosy-Finches. It's been awhile since we've birded up in the mountains, and it would have been nice to go find some Gray Jays, Clark's Nutcrackers, Pine Grosbeaks, and more while we were out. 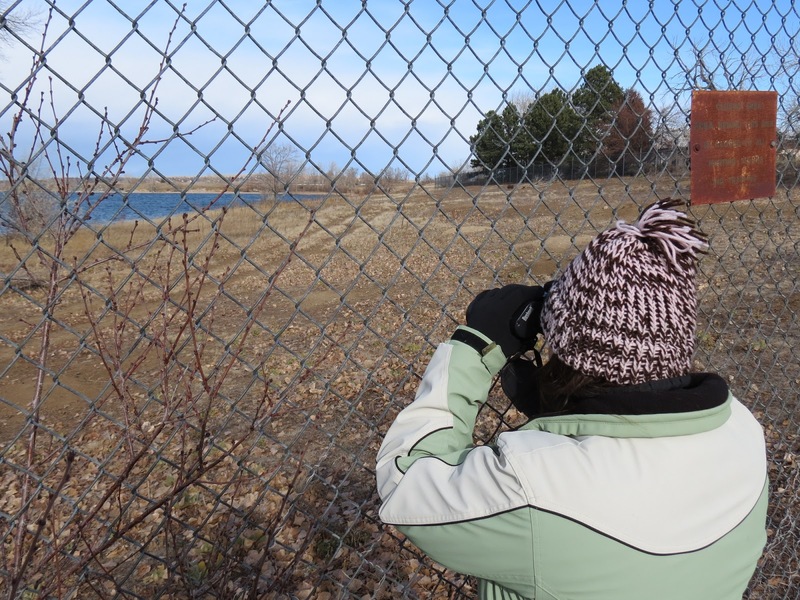 With the late start, there was no way to squeeze everything in, so we ended up just chasing the Red-throated Loon, and making our third try at the Northern Cardinal. Maybe next week we'll manage to get an earlier start. 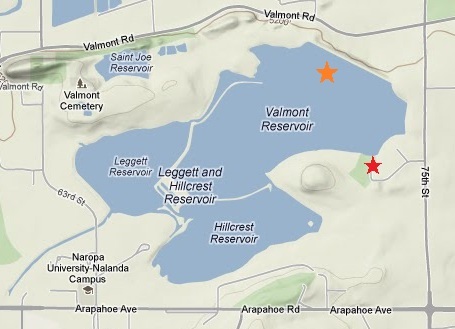 Parking spot indicated by the red star, location of Red-throated loon indicated by the orange star. A Red-Throated Loon was first found by Steven Mlodinow on Thursday (Dec 6), and was re-found later the same day and again on Friday (Dec 7) by other birders. Valmont Reservoir can be one of the best locations for wintering waterfowl in Boulder County, as during the colder times of the year, it can often be the only water around that is not frozen over. The best access to see the Red-throated Loon can be found by entering the Boulder County Open Space and Mountain Parks Annex from 75th street, and using the visitor parking by the headquarters building at the end of the road. Unfortunately a chain link fence and a number of trees on the southern shore of Valmont Reservoir impede the view from this location. between the links. Valmont Reservoir, Boulder County. December 8, 2012. We were disappointed by the strong wind when we arrived, which made for rough conditions to try to see and photograph distant birds. We didn't even bother to get the scopes and tripods out of the car, since in that kind of wind they vibrate so much they're nearly useless. At first we saw almost no birds. Lots of prairie dogs, but no birds. After a few minutes of scanning the distant water, we started to turn a few things up. There was a pair of Red-tailed hawks trying to simultaneously hunt and remain right side up in the wind. Then a Pied-billed Grebe diving repeatedly on one of the shallow ends. A couple of Ring-billed Gulls circled higher above the reservoir. A mix of Canada and Cackling Geese sat on the shoreline tucking their bills in their backs. A handful of Redheads bobbed about in the choppy water, doing their best to keep the wind off their faces. No sign of the Red-throated Loon, or the Western Grebes it was reported to be associating with at first. Red-tailed Hawk. Valmont Reservoir, Boulder County. December 8, 2012. After giving up on spotting the Red-throated Loon close enough for a nice view, we started scanning the distant, northern shore of Valmont Reservoir. We were thrilled to be able to start spotting birds amidst the choppy waves that the wind was stirring up. First was a half dozen Common Mergansers, with a single Red-breasted Merganser joining in. Next we spotted a Horned Grebe, hanging out near the mergansers. Scanning a little more, we eventually found two Western Grebes, and were hopeful that we'd find the Red-throated Loon associating with them again. After staring and concentrating for several minutes, carefully reviewing each bird, we were able to pick out a few distinguishing characteristics for the Red-throated Loon: neck shorter, more vertical than Western Grebe; bill held slightly above horizontal as with most loons; gray back, about as long as Western Grebe, but flatter; neck white on the front, gray on the back, but with a more gradual contrast than the sharp contrast on a Western Grebe; bill not yellow, and too short for Western Grebe; white on front of neck too extensive for any other loon. It certainly wasn't a soul-satisfying-view, but we were still glad to find the Red-throated Loon, both because it would be a great bird to spot any time, and because it just happened to be our 300th life bird! Too bad the bird was almost half a mile away, too far out of range for our camera to snap any usable photographs. 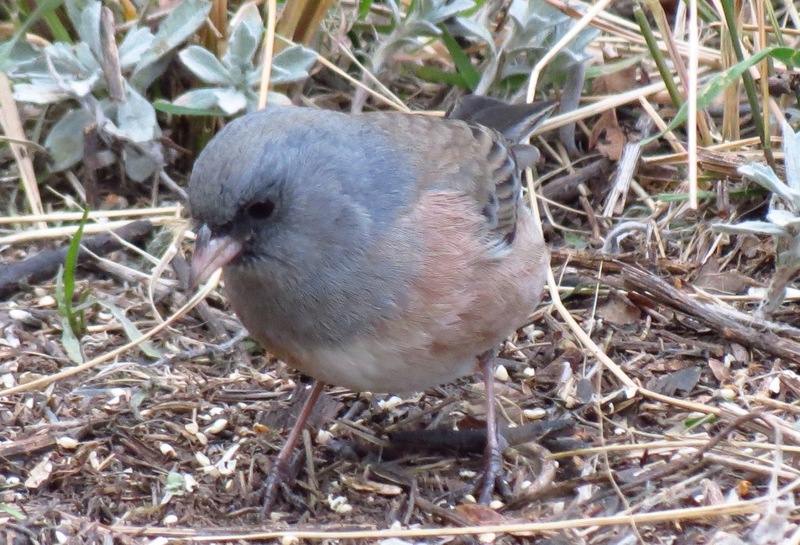 Dark-eyed Junco (pink-sided). Dakota Ridge Trail, Boulder County. December 8, 2012. Next stop was Dakota Ridge Trail to make our third attempt at the Northern Cardinal that has now been seen off and on again for nearly month. 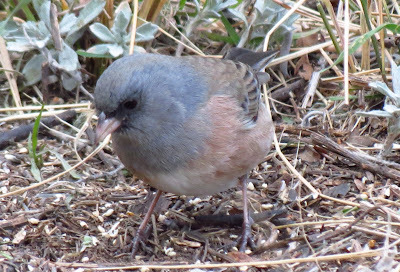 After spending 45 minutes enjoying the abundance and variety of Dark-eyed Juncos hanging out near the pump house where the cardinal has been reported, we heard the Northern Cardinal sing from somewhere further up the hill, deep in the vegetation. Although he sang for 3 or 4 minutes we were not able to lay eyes on him. We hung around awhile longer, hoping to catch a glimpse, or at least hear him again. A few other birders came by hoping to see the bird as well. No word on whether it made an appearance for them after we left.